The Arsenal had long been on my list of burgers to try on the West Side. I invited the Los Angeles Editor of UrbanDig, Danielle Lehman, along to sample what had been reviewed elsewhere as a promising burger. The Arsenal was not open for lunch, so dinner it was. Valet parking was only 4 bucks, and that was a lot easier than finding parking on that stretch of Pico. On the evening that I went, The Arsenal appeared to be under-staffed, and the resultant service was slow. Our server had about 15 tables in her section. I ordered the All-American Burger with a side of Poutine Fries and a salad. The burger arrived about 15 minutes later. The Beef. : The Arsenal used Harris Ranch Chuck. Harris Ranch was about as cruelty fee as it got when it came to corn-finished, feed lot beef. The beef arrived pre-ground at a medium setting at The Arsenal's kitchen. The fat content was about 20%, and the burger was not greasy in the least. The burger patty presented a beefy flavor, and aside from a mild hint of carbon flavor, that was the full extent of the flavors brought to bear by the burger portion of the cheeseburger. There was no aged funk, no minerality, and no blood. The burger patty was over-cooked, so it was also on the dry side. The beef was competent in the way that most fast-food burgers are competent. The bite was firm and not chewy. The Seasoning: The exterior of the burger patty was lightly salted as it cooked. 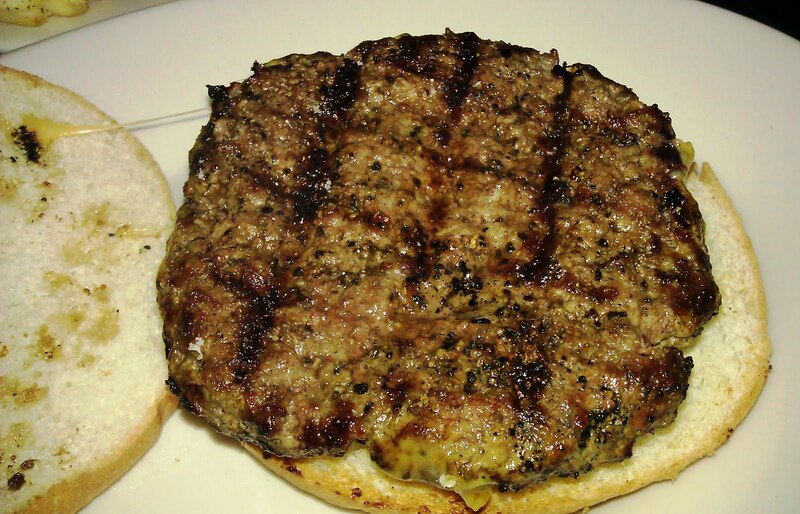 The Sear: The Arsenal grilled the burger patty, and it picked up some unimpressive grill marks. I hoped that the trade-off for over-cooking my burger would have been a thorough sear, but that was not the case. The charred flavor appeared to have been the result of the peppering of carbon flecks, which were transferred to my burger from a messy grill. The Preparation: The 8-ounce patties were hand-formed during day prep. The pre-ground Chuck did arrive with some gristle, but this was not an overwhelming amount. The burgers were cooked on a not-hot-enough gas grill. The burgers were flipped three times during the cooking process, and this contributed to the dryness of the beef. A burger should only be flipped once on a hot grill or griddle. I ordered Medium, and my burger arrived cooked to a dried-out Med-Well. The Cheese: The shredded Cheddar, which topped my burger for an extra $1.00, was sharp and creamy. Sadly, that cheese was deposited in a cold pile atop my burger patty. The cheese only melted after I let the burger sit for about 5 minutes with the top bun in place to retain the heat rising from the patty. The result was a lukewarm burger with semi-melted cheese. Topping a burger with cold cheese seemed lazy and careless. Meh. 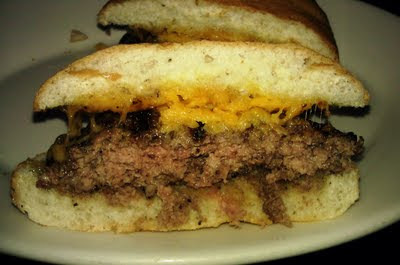 The Bun: The bun at The Arsenal was a flat, unseeded, un-toasted, cool, dryish, standard, burger bun. It was mild, not sweet, and moderately yeasty. Mostly it was a little dry. The bun was not toasted so it provided no crunch, and it further served to wick away the much-needed heat rising from the over-cooked patty. The Meat To Bun Ratio: This would have been fine in the event that the beef and bun had not both been dried out. The Sides: The waffle-cut fries were delivered frozen and par-cooked, but they were properly cooked and crisped by the kitchen. HOWEVER, the gravy, which covered the Poutine Fries, was clearly from a can or dry package mix. This gravy was of the same quality that one might expect at an elementary school cafeteria or a frozen TV dinner. The Horseradish Cheddar appeared to have been replaced with a tame, shredded Mozzarella . The Poutine Fries were disappointing. The side salad was a wild green blend, but it was wilted, limp, and well past its prime. I did not bother with the salad. The Toppings: The tomato slice was deceptively red, since the texture was decidedly mealy. The iceberg lettuce was pallid and bland. 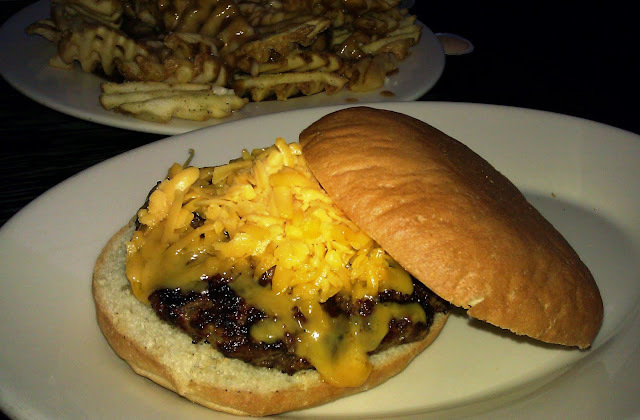 The Value: The All-American Burger at The Arsenal was $10.00--$11.00 with a pile of cold, unmelted Cheddar tossed on top. The flavor of the beef was average, but the poor quality of the preparation, the wilted salad, and the mealy tomato had me leaving hungry after dropping $11.00 on a cheeseburger and $4.00 on parking. The value was quite poor at The Arsenal. 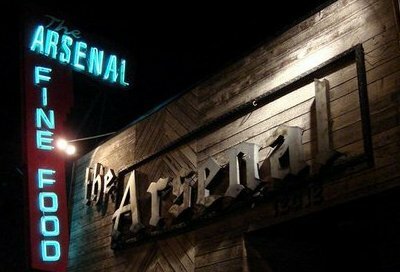 The Arsenal did not serve up a cheeseburger for which I would return. The service was friendly but slow. The burger was relatively bland, and the ingredients were stale and mishandled. The burger was over-cooked. The bun was cool and untoasted. Finally, the addition of cold, unmelted cheese, caused the dish to be lukewarm. Burger Review : Pass. The Taco Bell down the street served better and more competently prepared meals.